Vodafone India just launched a brand new webstore on facebook this week. Now it gets easier to get things done while having fun or just hanging around with friends. Now with just a click you can pay your Postpaid bill, Recharge your phone, Set Callertunes, Download Vodafone M-Shop on your mobile and get exclusive offers. 1. Log into your account on facebook. 2. Click on the link above. It will take you to your facebook account where you need to authorise or click on the button ‘allow’ for the app to acces you account. 3. Once you do that, the Vodafone webstore will be available on the left hand side panel under your profile picture. 5. Click on any of the services you’d like to avail. 6. you will be taken to an external link. 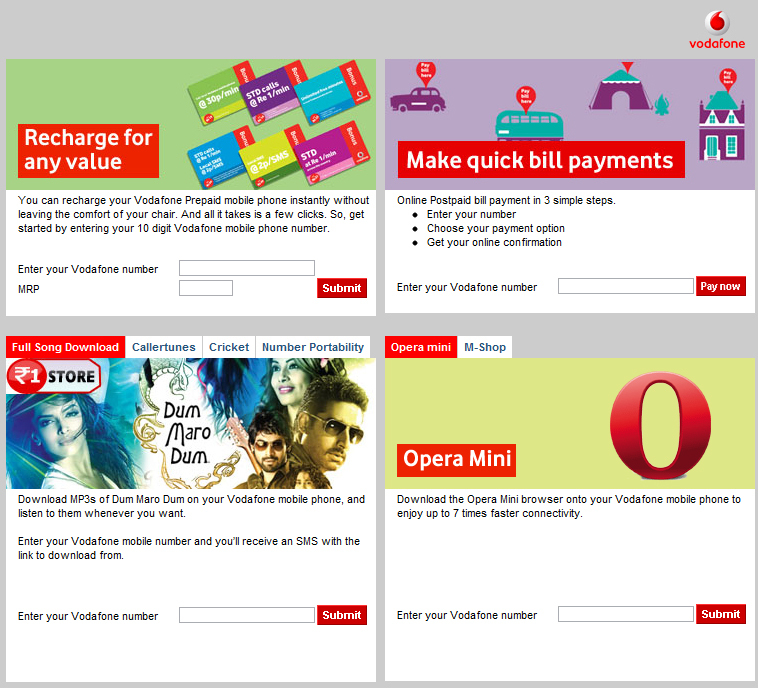 From there on, the transactions will be carried on as they happen on the Vodafone.in website. I don’t know how useful this application will prove to be considering that I can go on to Vodafone.in and do the exact same stuff. Though, it might act as a constant reminder to pay my bills whenever I log on to facebook. Also, it saves me 2 sec of typing the vodafone url or googling it and getting on to the website. I’m looking forward to some deals and coupons for customers trying out the vodafone facebook webstore and using it to transact. That, will definitely give me an incentive to use it and share it will all my hutch-orange-vodafone friends. square – the new shape of money! On 25th August I purchased a new Vodafone postpaid connection from Vodafone store. I used my number for just making calls and sending SMS, which I was told are free. Now they sent me, bill of Rs. 1249.25. In the bill they have charged Rs. 649 for internet surfing & downloading & they also charged Rs. 150 for activating some Special service of Vodafone which I hadn’t activated. And when I made a call at their customer service number and discussed about my bill issue they neglect that. Company had barred my outgoing calls. And after that they use to make me calls again and again that if I won’t pay the bill amount they would suspend my Incoming service also. So I submitted my complaint against Vodafone at http://www.consumercourt.in/mobile-billing-problem/106858-vodafone-bill-payment.html. Now I am waiting for my complaint reply. Hope I get help from Consumer Court soon.